The chaotically charming Hôtel Drouot in Paris’ 9th arrondissement is the epicenter of the French auction house world, where dealers, collectors and the simply curious flock to daily public auctions featuring fine art in all styles, furniture, jewelry, books, silver, china, wine, and objets d’art. Approximately 800,000 lots are sold each year with prices in the hundreds of euros to several millions. There are more than 16 preview galleries and 70 independent auction firms that hold sales under the umbrella of Drouot. It is worth stopping by Drouot to preview the jam-packed galleries and general frenzy of collecting, but beware of bidding, The New York Times recently reported that an art-trafficking ring had surfaced at Drouot, after years of speculation of widespread corruption. The French system of selling art and antiques at auction is entirely different than the British model and filled with tradition and regulations dating back to the 16th century. In order to become an auctioneer in France, or commissaire priseur, you must earn advanced degrees in both law and art history, followed by two years of apprenticeship. 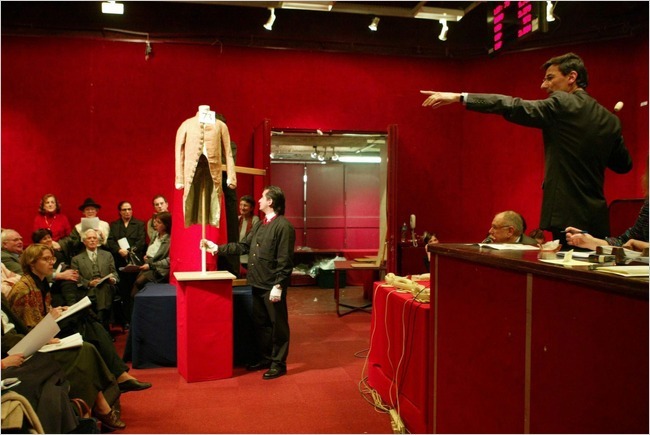 France has many auction firms that compete with the dominant Sotheby’s and Christie’s, from the larger Tajan and ArtCurial to smaller independent auction firms that organize sales at the famous Hôtel Drouot. Some would argue that the French auction system is too old fashioned and rigid, but it is important to understand if you are interested acquiring hard to find pieces for a relative bargain. In fact, many dealers crowd the Drouot salesrooms to pick up works cheaply and then resell them privately or at larger auction houses.